From the top: Salomon X-Adventure 88, Fischer E-77 and Kärkinen Eräsuksi. My oldest pair of skis is the Fischer E-77, sometime from the end of the nineties. These skis have been my number one choice for just about any trip. They have worked well skiing in the Kilpisjärvi-Halti region in Lapland in April, on the ice in Kvarken and on shorter trips closer to home. I even sometimes commute to work with them. They are narrow enough to fit into groomed XC ski tracks (58-52-56 mm) and have steel edges to get some bite on hardened crust in the fells. A fish scale pattern provide grip going uphill. We generally don't get very deep snow here in Southern Finland, so they usually work well enough even in loose snow, but lacking floatability and having a stiff tip they are sometimes still rather suboptimal. The Salomon X-Adventure 88 skis were a bad purchase, not because the skis are poor, but rather since I don't really have any use for them. 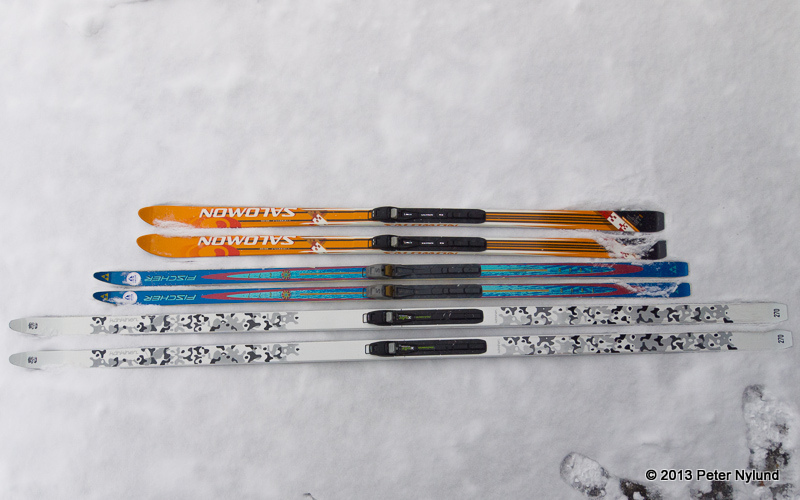 I got them cheap, but I'm currently not going to spend much time skiing in fells, where these skis make sense. They are quite short (189 cm) and have a sidecut that makes them fun (88-60-78) going downhill. The fish scale pattern gives a decent grip going uphill and these would be my current choice if I were to do some fell skiing, but that seems a little unlikely right now. I've used them on a single trip to get some more floatation in the spring. My newest pair of skis is the Kärkinen Eräsuksi. 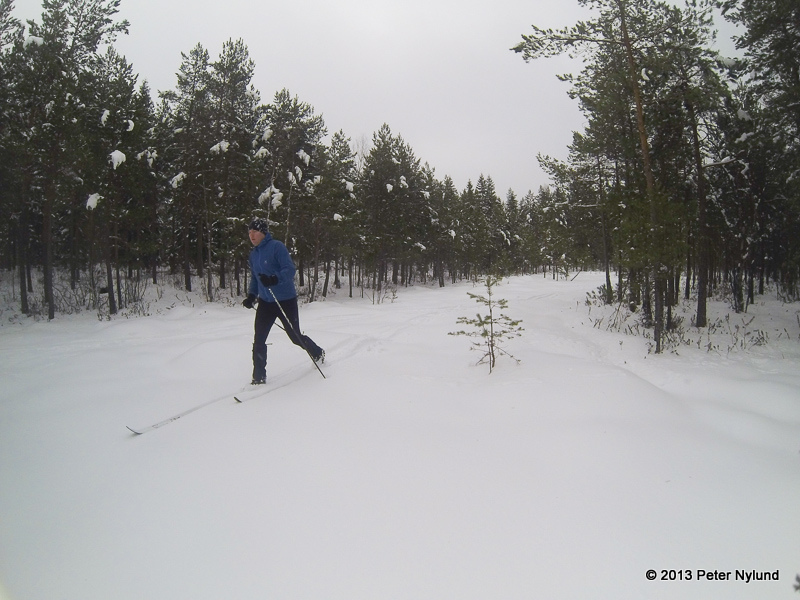 With a length of 270 cm and a width on 7 cm it is a traditional Finnish forest ski. The tip is loose to work well in deep snow. I have yet to try them really deep snow, but this far they seem great. When the snow is really loose, no amount of width or length is enough to keep the ski floating, but a long ski with a loose tip still makes it possible to ski. 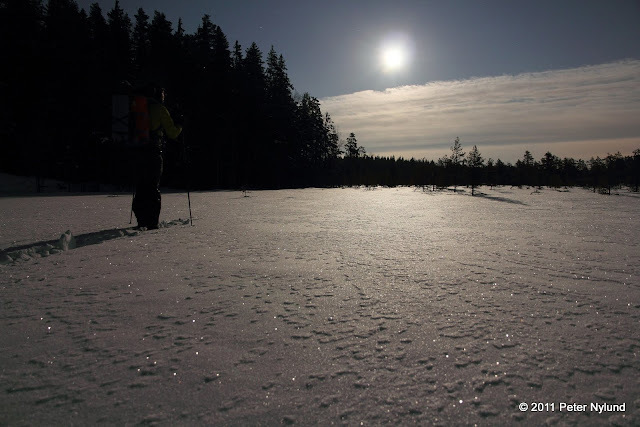 The loose tip always go up to the surface, making the going a lot easier than if the ski always is below 40 cm of snow, something which I've experienced with my Fischer E-77 skis. 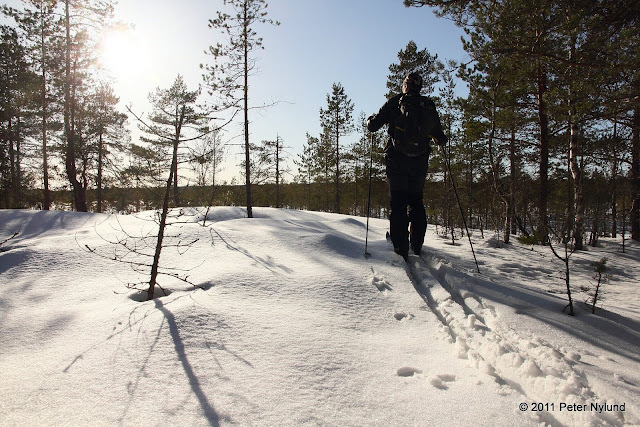 The length makes the skis a little more clumsy, but for someone my height they still work well and I haven't found them too bad in really dense forest either. They are not a good choice for hilly country, though, since they are difficult to turn going downhill. For that purpose, a pair of the new snowshoe/ski hybrids should work better, though I don't see how those could be a better choice in the typical Finnish forest and bog landscape. 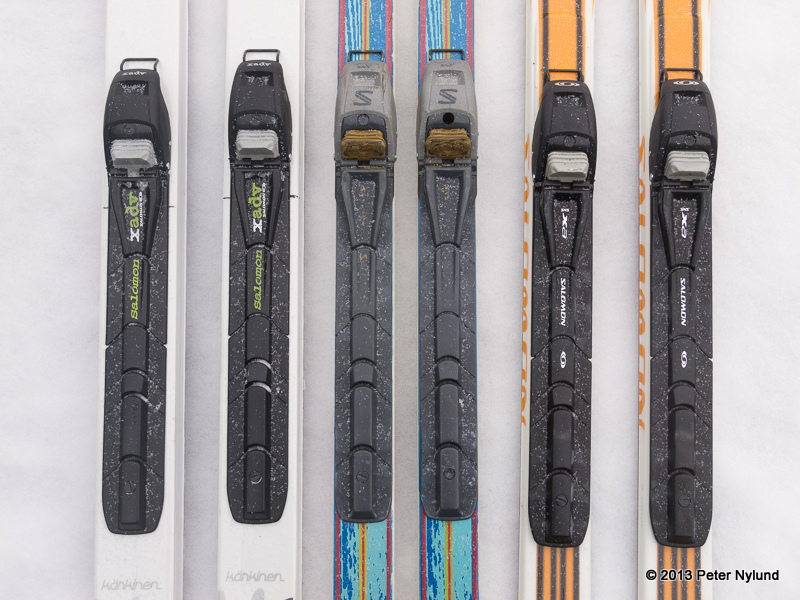 The Fischer E-77 skis have the first model of the Salomon BC binding, the Salomon SNS Backcounty. It is still going strong, and I think this type of binding is an excellent choice. Another option is the very similar, but incompatible, Rottefella BC system. The picture below show some different models of the Salomon BC binding, with the oldest one in the middle. The two other bindings look to be exactly the same binding with different names. All the bindings are manual versions, since the automatic one is supposed to have some problems. I'm now on my third pair of boots for the binding. The first pair of boots wasn't very great, but I was very satisfied with the Salomon X-Adventure 7 boots from 2005 (I think). 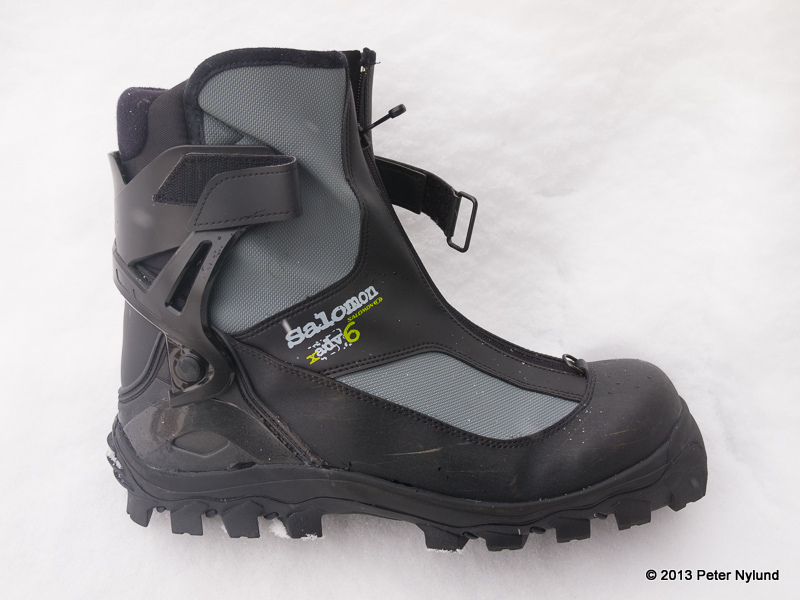 Due to my frostbites last winter I had to buy bigger boots to keep the toes warm and I now use a pair of Salomon X-Adv 6 boots, which also are great. Using bindings like these for the forest skis is very nontraditional, but I think real ski bindings make the skiing feel a lot better that the traditional rubber boots and associated generic binding. The only time a traditional rubber boot is better would be the really wet conditions, like JJ demonstrates here. In addition to the skis above, I have a pair of wide telemark skis with Scarpa T4 boots, a not so good pair of XC skis for traditional style and a pair of XC skating skis. Since I live only a five minute walk from a groomed XC ski track, my XC skating skis actually get the most use, though that type of skiing mainly for exercise and training, rather than for the pure fun of skiing.